The history of marbles traces back to ancient China, and marbles were also found in the great pyramids of Egypt. Today's collectible marbles are from the late 1800s and newer; usually they are machine-made or contemporary. Marble collecting is all about displaying specific-colored marbles. Size, quality and design are important. Those who used to "knuckle down" are now polishing their eye loupes for a closer look at their old playthings. Center your marble collection on one element and learn all you can about that element. This narrows your scope and gives you fewer characteristics to identify . For instance, determine whether you are interested in German or Dutch marbles from the 19th century or whether you prefer marbles from Akron, Ohio. Narrow down the design of the marble and know the designs to which terms, such as peppermints, ribbon swirl or gooseberries, refer. Know the difference between handmade (individually crafted), machine-made (ceramic or glass manufactured on a machine) and contemporary (modern marbles made by glass artists). Old, handmade marble generally have a pontil, a rough spot where the sphere was removed from the glass cane. Be familiar with leading marble manufacturers such as Marble King and the Akron Agate Co. Recognize marble types. Clambroth marbles from Germany, for instance, are milk glass marbles with exterior swirls dating from the late 1800s. If the base glass is black and blue, it is a rare find. According to AkronMarbles.com, onionskins, a handmade marble with elongated colored flakes over their surface, are a significant find. Visit a marble collecting forum online, like MarbleForum. From marble makers to clubs, these sites offer a wealth of information. Ask questions on the forums and view archived questions to learn from other members. Attend marble collector shows such as the Orange County Marble Show or Pride of the Prairie Show to learn, share and trade information, improving your marble knowledge. Join marble collector communities such as MarbleCollectors.org and Marble Connection. Request a newsletter from LandofMarbles.com or the International Association of Marble Collectors to keep abreast of marble news. Visit museums with marble collections. The National Marble Museum in Yreka, Calif., and the Marble Kids Museum in Raleigh, N.C., are just two of many. Attend the National Marbles Tournament held in Wildwood, N.J., or the Mountain Man Marble Tournament in Jackson's Mill, WVa. 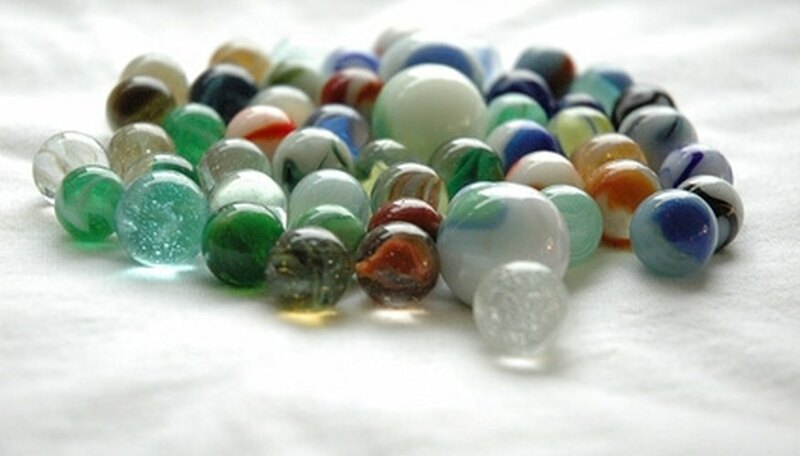 Purchase marbles from reputable dealers. Store marble collections like you would a coin or stamp collection to keep them in the best condition. Show them off on display rings, in see-through trays or keep them in a Lucite marble suitcase that separates them and protects them from nicks and scratches. Marbles are a choking hazard to small children and pets. Never store marbles in a jar. Have a professional clean and repair marbles. Never clean, polish or buff them yourself.